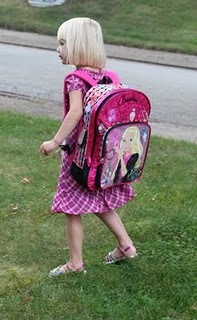 The first day of preschool was yesterday. Juliana was so excited! 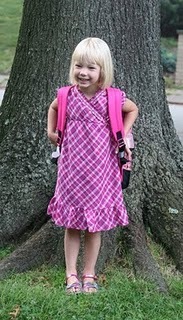 I bought the dress several weeks ago and she has been waiting impatiently to wear it – pink and purple of course. I let her pick out the backpack – after I vetoed Hannah Montana – and she selected Barbie because it is pink and has pictures of jewelry. She put the backpack by the door before bed last night and she walked around the house in the morning wearing her backpack for about 10 minutes before it was time to go. Last year all of the 3 and 4-yr olds were in one room; this year the preschool is divided into separate classrooms for the 2 ages. Juliana’s teacher from last year is in the 4-yr room this year and Juliana was very excited to get back to Miss Moran. We were happy to have her back with Miss Moran to make drop-off in the morning easier. I was waiting for the first-day-of-school photo. I was so excited to go hiking last month, I did the same thing with my backpack.